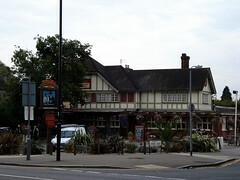 Large McMullen pub in Enfield Town, not too far from Trent Park. Note: According to Pubs Galore comments (linked below), the Jolly Farmers saw an extensive refurbishment in mid-2012; and hence some of the information below may be out of date. Although it's quite large, it still seems cosy, due to the low ceiling and the fact that the space is broken up into different areas. There are tables and chairs for dining, plus a number of comfortable leather sofas. For some reason it's slightly reminiscent of the good kind of hotel bar. Kake visited on a Monday lunchtime in October 2007; there were quite a lot of people in, many of them also having lunch. The staff were very friendly. Piped music was an assortment of '90s chart stuff, nothing very exciting, but not obtrusive. There were at least three McMullen's ales on. A pint of Country Best was £2.80. Food is served (not sure of the exact times). The menu is fairly extensive, and there's a separate children's menu as well. One nice touch is that four of the main course items are available in smaller portions, at lower prices, for those who don't have huge appetites: sausages with bubble and squeak and red wine gravy (£5/£7), chargrilled chicken and bacon salad (£5.45/£7.45), fish and chips (£5.25/£7.25), and scampi and chips (£5.45/£8). Starters are between £3 (soup of the day with crusty bread and butter) and £5 (honeydew melon fan with parma ham; roasted tomato and dolcelatte tart). Beefburger is £6.75, and they also offer three cuts of steak: 6oz ribeye at £7.45, 8oz sirloin at £10, and 10oz rump also at £10. Jacket potatoes are £4.45 (seven choices of fillings) and sandwiches are £4 (e.g. bacon buttie; sausage and fried onion; cottage cheese and pineapple). Mains are between £7 (e.g. ploughmans platter) and £10.90 (barbecue ribs), and desserts are £3.25-£4. I think they also do specials, but I'm not sure. Note that at the time of writing (October 2007), the menu on their website is slightly different from the printed one I saw in the pub. Kake tried the Hertfordshire sausages with bubble and squeak and red wine gravy (£7); the sausages were good, as was the gravy, though the bubble and squeak was actually just mash with veg in. It was real home-made mash, though; I know this because I found a huge chunk of potato in it that had managed to escape the mashing process (this is not a complaint). The food came very quickly after ordering. Quiz night is Sunday from 9pm. Last visited by Kake, October 2007. Food prices taken from menu on that visit. Quiz night info taken from blackboard outside on the same visit. Last edited 2017-02-05 19:43:39 (version 10; diff). List all versions. Page last edited 2017-02-05 19:43:39 (version 10).